Elly Wedge took up the fiddle at age 4 and hasn't looked back since! She's no stranger to audiences of all ages and genuinely loves to entertain people. You'll find her playing at numerous special events, weddings, ceilidhs, country fairs, senior's homes, community celebrations, private parties, fundraisers, concerts, etc. She is classically trained and takes lessons and learns from some of Canada's top fiddlers. Last but not least, Elly is a competitor in old time fiddle and stepdance competitions across the country. Elly is a past member of the Ottawa Youth Orchestra Academy, a member of the Ottawa Traditional Fiddle and Folk Art Society, and the Canadian Grand Masters. She is a two time Shelburne Canadian Open Winner in her age group and a two time winner at the Maritime Fiddle Festival. 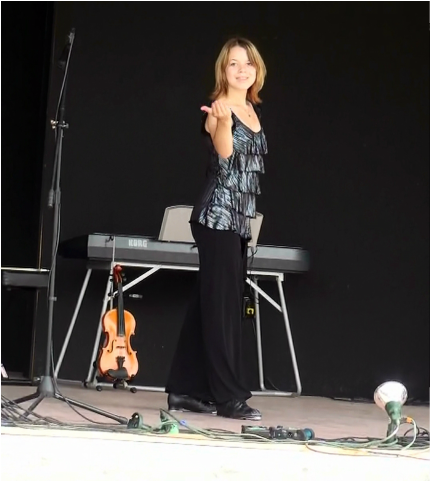 In 2013, Elly was thrilled to be invited to perform at the Canadian Grand Masters Fiddling Championships in the Junior Showcase. She performs regularly with various instrumentalists and also with her fiddle duo, Elly Squared, a group formed in 2006. Elly is also a guest fiddler with the Richmond Ramblers Bluegrass Band. She continues to diversify her musical repertoire with roots stemming from Old Time, Celtic, Irish, Scottish, French Canadian, Cape Breton, traditional styles. Elly often plays for stepdancers and she enjoys adding step dancing to her own performances.